It is essential that the navigation system correctly tracks the current vehicle position and displays it on the map. 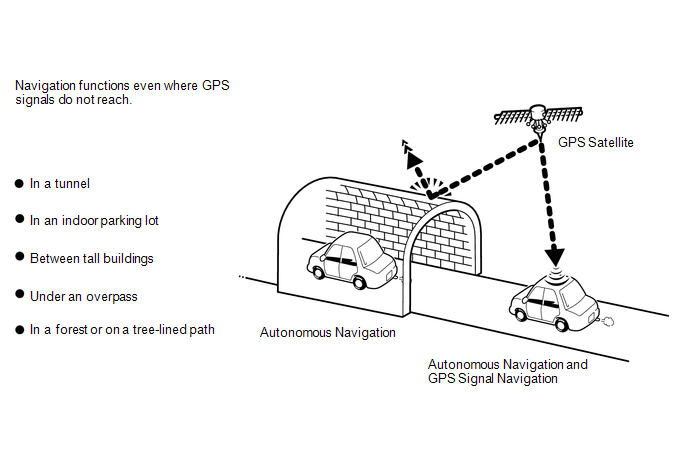 There are 2 methods to track the current vehicle position: autonomous (dead reckoning) and GPS* (satellite) navigation. Both navigation methods are used in conjunction with each other. The navigation receiver assembly calculates the current vehicle position (direction and current position) using the direction deviation signal from the gyro sensor and driving distance signal from the vehicle speed sensor and creates the driving route. 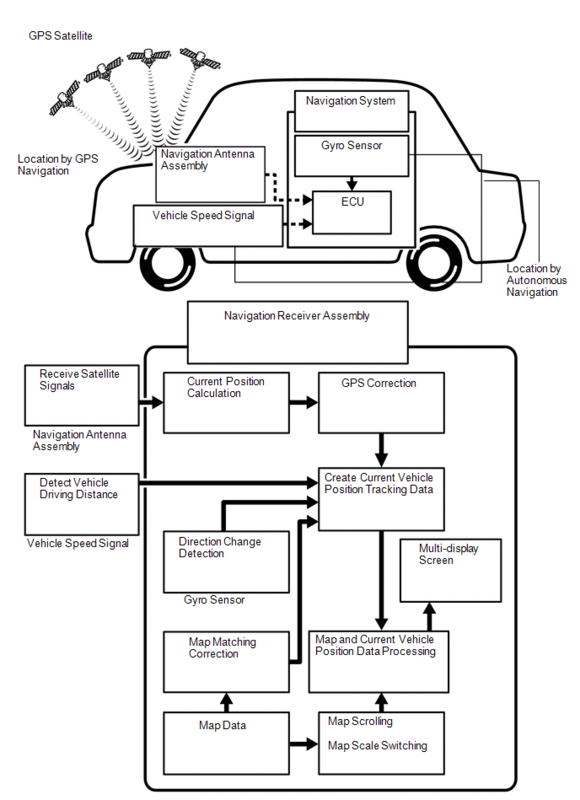 The navigation receiver assembly processes the vehicle position data, vehicle driving track and map data from the SD card. The map data from the SD card is compared to the vehicle position and driving track data. 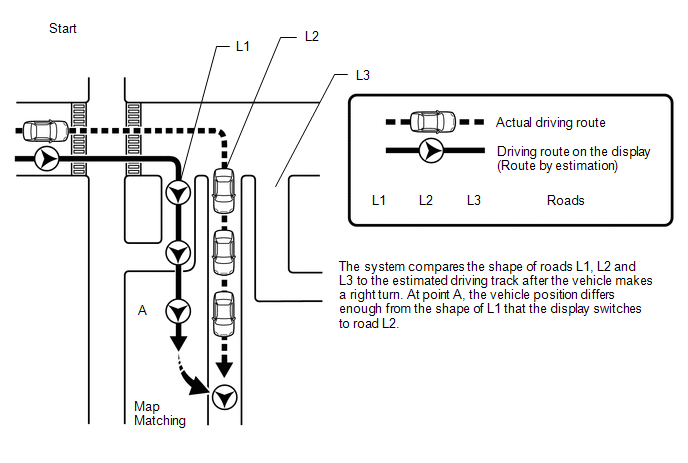 Then, the vehicle position is matched with the nearest road. The vehicle position is matched to the position measured by the GPS. Then, the GPS measurement position data is compared with the vehicle position and driving track data. If the position is very different, the GPS measurement position is used. The vehicle speed signal includes the error caused by tire wear and slippage between the tires and road surface. Distance correction is performed to account for this. The navigation receiver assembly automatically offsets the signal to make up for the difference between it and the distance data of the map. The offset is automatically updated. The combination of autonomous and GPS navigation makes it possible to display the vehicle position even when the vehicle is in places where GPS signals cannot be received. When only autonomous navigation is used, however, the mapping accuracy may slightly decrease. 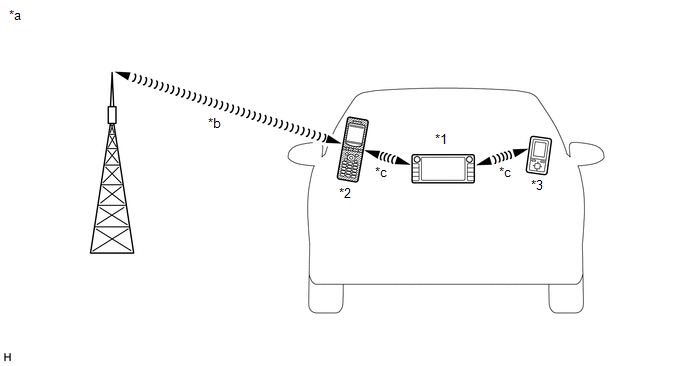 This method determines the relative vehicle position based on the driving track determined by the gyro located in the navigation receiver assembly and the vehicle speed signal. Used to calculate the direction by detecting angular velocity. It is located in the navigation receiver assembly. Used to calculate the vehicle driving distance. 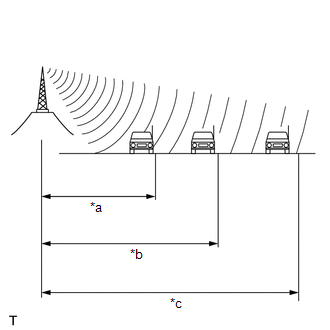 This method detects the absolute vehicle position using radio waves from GPS satellites. *: GPS satellites were launched by the U.S. Department of Defense for military purposes. 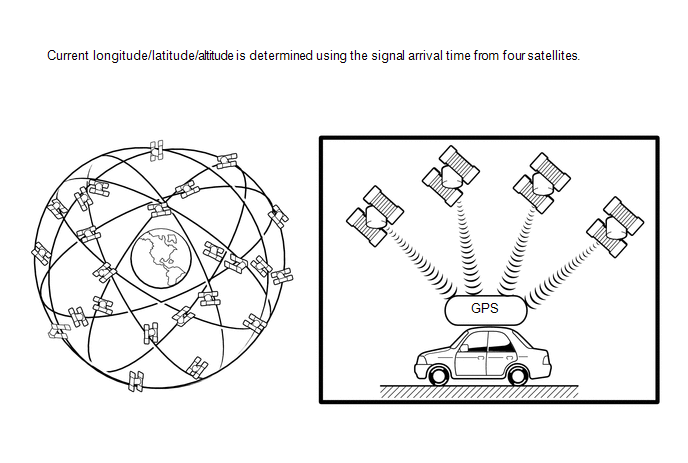 Vehicle position cannot be obtained because the number of satellites is not enough. Vehicle position is obtained based on the current longitude, latitude and altitude. The current driving route is calculated by autonomous navigation (according to the gyro sensor and vehicle speed signal) and GPS navigation. This information is then compared with possible road shapes from the map data in the SD card and the vehicle position is set onto the most appropriate road. 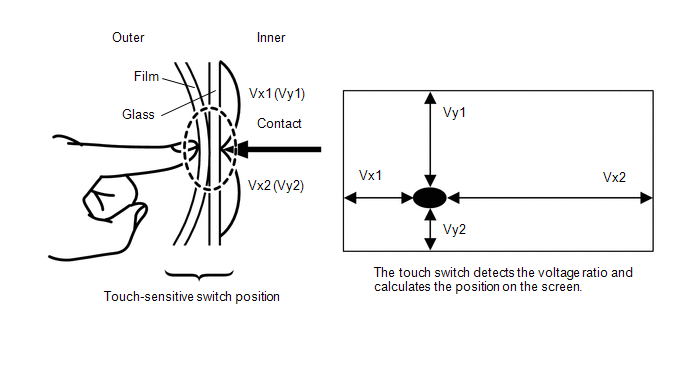 Touch switches are touch-sensitive (interactive) switches operated by touching the screen. When a switch is pressed, the outer glass bends in to contact the inner glass at the pressed position. By doing this, the voltage ratio is measured and the pressed position is detected. (a) A compact disc player uses a laser pickup to read digital signals recorded on a compact disc (CD). By converting the digital signals to analog, it can play music and audio. Do not look directly at the laser pickup because the CD player uses an invisible laser beam. Be sure to operate the player only as instructed. Do not disassemble any part of the CD player. Do not apply oil to the CD player. Do not insert anything but a CD into the CD player. Copy-protected CDs cannot be played. DualDiscs that combine DVD recorded material on one side with CD digital audio material on the other cannot be played. Keep the discs away from dirt. Be careful not to damage the discs or leave your fingerprints on them. Leaving the disc exposed halfway out of the slot for a long time after pressing the disc eject button may cause deformation of the disc, making the disc unusable. If discs have adhesive tape, stickers, CD labels or any traces of such labels attached, the discs may not be ejected or player malfunctions may result. Do not use odd-shaped CDs because these may cause player malfunctions. Use only 4.7 in. (12 cm) CDs. Do not use 3 in. (8 cm) CDs either with or without adaptors. When it is cold or it is raining, if the windows mist up, mist and condensation may form in the player. 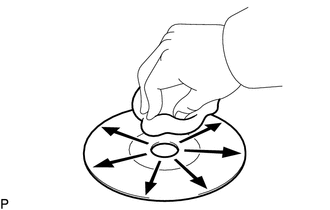 In such cases, the CD may skip or stop in the middle of play. Ventilate or dehumidify the cabin for a while before using the player. The CD may skip if the player experiences strong vibrations when the vehicle is driven on rough roads or similar uneven surfaces. (1) Only CD-ROMs, CD-Rs (CD-Recordable), CDRWs (CD-ReWritable) and USB device can be used to play MP3/WMA/AAC files. CD-Rs and CD-RWs are more easily affected by a hot and humid environment than discs used for normal audio CDs. For this reason, some CD-Rs and CD-RWs do not play. If there are fingerprints or scratches on a disc, the disc may not play or the CD may skip. As for MP3/WMA/AAC files written in any unlisted format, the contents of the files may not be played normally or the file names or folder names may not be displayed correctly. This player is compatible with multi-session discs and can play CD-Rs and CD-RWs on which MP3/WMA/AAC files have been added. However, only the first session can be played. Discs whose first session includes both music data and MP3 or WMA and AAC format data cannot be played. (1) The "Bluetooth" built-in navigation receiver assembly and a "Bluetooth" compatible cellular phone*1 can be connected using a "Bluetooth" wireless connection. This enables the use of the hands-free function on the cellular phone even if the phone is in a pocket or bag. For this reason, it is not necessary to use a connector or cable to connect the cellular phone. *1: Some versions of "Bluetooth" compatible cellular phones may not function. *1: This profile is necessary when using hands-free function. *2: This profile is necessary when using message function. *3: This profile is necessary when using the Entune App Suite function (w/ Entune App Suite Function). "Bluetooth" compatible cellular phone can be checked at http:// www.toyota.com/entune/. The amount of remaining battery charge displayed on the navigation receiver assembly may be different from that of the "Bluetooth" device. (1) The "Bluetooth" built-in navigation receiver assembly and a "Bluetooth" compatible portable audio player*1 can be connected using a "Bluetooth" wireless connection. This enables files stored in the portable audio player to be heard from the vehicle speakers. In addition, operations such as play/stop can be performed directly from the navigation receiver assembly. *1: Some versions of "Bluetooth" compatible audio players may not be able to operate the "Bluetooth" function, or music may play, but functions available using the navigation receiver assembly may be limited. (a) Entune is a service that enables Entune applications and Entune content from a cellular phone to be used via the extension module screen. As Bluetooth communication is used for the communication between a cellular phone and the extension module, before using the "Entune" service on the navigation system, the cellular phone needs to be registered with the navigation system as a Bluetooth device. For details regarding "Entune" operations, each of the applications and compatible phones, refer to http://www.toyota.com/entune/. 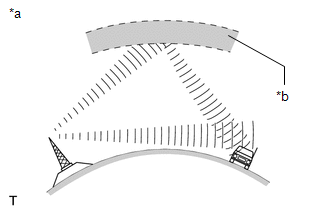 Fade out is caused by objects (buildings, mountains and other such large obstacles) that deflect away part of a signal, resulting in a weaker signal when the object is between the transmitter and vehicle. 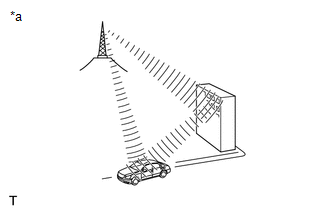 High frequency radio waves, such as FM broadcasts, are easily deflected by obstructions. Low frequency radio waves, such as AM broadcasts, are less likely to deflect. (a) "HD Radio" system is a radio system that broadcasts in the IBOC (In-Band On-Channel) form that the iBiquity Co. has developed. By expanding the bandwidth per channel of conventional FM/AM bands, digital audio and data signals are additionally transmitted. "HD Radio" Technology manufactured under license from iBiquity Digital Corporation. U.S. and Foreign Patents. "HD Radio" and the HD and HD Radio logos are proprietary trademarks of iBiquity Digital Corp. The information for the music currently being listened to is stored in the system and transmitted to the "iPod" connected to the system. The information transferred to the "iPod" can be used for purchasing the music through "iTunes" music store. (a) Satellite Digital Audio Radio Service (SDARS) is a satellite digital radio broadcast provided by Sirius XM Radio Inc. The broadcast (pay-type) is performed through satellites and terrestrial repeater networks. Several unique channels are available, and even if a vehicle changes locations, the same information can be received without breaks. Information such as song names, broadcast station names, etc. can be received. Also, traffic information can be received and displayed on the multi-display screen. To receive audio-visual pay-type broadcasts, the customer must enter into a pay-type contract with XM Satellite Radio Inc. After entering into a contract, registration of an 8-digit XM Radio ID is necessary. Also, if parts are replaced, the XM Radio ID must be reregistered. (a) The No. 1 stereo jack adapter assembly is equipped with a USB terminal. Connecting a USB device or "iPod" to the No. 1 stereo jack adapter assembly allows music files to be played. Not only is it possible to play music from a USB device with audio functions, is also possible to play MP3 or WMA music files that are stored on a USB device. In addition, "iPod" control software is installed, allowing file selection from playlists and operation using shuffle mode. Visual contents of an "iPod" cannot be played. MP3, WMA and AAC files written in any format other than those listed above may not play correctly, and their names and folder names may not be displayed correctly. 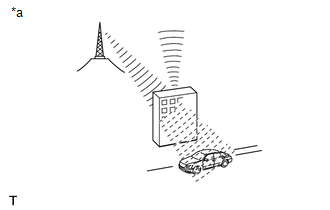 (a) The Automatic Sound Levelizer (ASL) function automatically adjusts the audio system volume level in order to compensate for increased vehicle noise (vehicle noise tends to increase as vehicle speed increases). The ASL adjusts the volume level based upon vehicle speed signals that it receives from the combination meter assembly. (a) Customization of functions can also be customized on the multi-display screen. Refer to Owner's Manual for further information on customizable items for the navigation system. Items available for customization via the navigation system can also be customized by using the Techstream. Some customize parameters displayed on the Techstream will be displayed on the vehicle customization screen for the navigation system. Users can customize these items. (1) Components of the navigation system communicate with each other via the AVC-LAN. (2) The AVC-LAN uses a twisted pair of wires for its communication lines. (3) The master unit of the AVC-LAN is the navigation receiver assembly. The navigation receiver assembly has the resistance (60 to 80 Ω) necessary for communication. If a short or open circuit occurs in the AVC-LAN circuit, communication is interrupted and the system will not operate normally. (1) Components of the navigation system communicate with each other via the local bus. (2) The local bus uses a twisted pair of wires for its communication lines. (3) The master unit of the local bus is the navigation receiver assembly. The navigation receiver assembly has the resistance (108 to 132 Ω) necessary for communication. If a short or open occurs in the local bus circuit, communication is interrupted and the system will not operate normally. (1) The navigation system uses CAN communication between the navigation receiver assembly and ECUs. (1) The navigation system uses LVDS communication, between the navigation receiver assembly and stereo component tuner assembly. (a) The navigation system has a diagnostic function (the result is indicated on the master unit).